Speyer (formerly known as Spires in English) is a city in Germany (Rhineland-Palatinate ) with approx. 50,000 inhabitants, located beside the river Rhine . It lies 25 km south of Ludwigshafen and Mannheim . Its oldest known name was Civitas Nemetum, named by a Teutonic tribe, the Nemetes, settling in this area. Around the year 500 Spira appears as the town's name in scriptures. Speyer has a compact centre which is dominated by the Speyer Cathedral , a number of churches and the Altpörtel (Old town gate). In the cathedral, beneath the high altar, are the tombs of eight German emperors and kings. 5,000-year-old finds from the Stone, Bronze and Iron Ages bear witness to permanent agricultural settlements at a Rhine ford in the area of present-day Speyer. After the conquest of Gaul by the Romans the Rhine became part of the border of the Roman Empire. The Romans erected camps and forts along the river from the Alps down to the North Sea. One of these camps was at Speyer, built around 10 BC for a 500-man–strong infantry group and also intended as a base for further conquests on the east side of the Rhine. The decisive factor for the location were the wedge-shaped high river banks, of which the tip pointed far east into the floodplain of the Rhine. Thus a settlement safe from floods became possible close to the river. Due to the river's extensive meandering such possibilities were very rare between Basel and Mainz. This Roman military camp later became the impetus for the development of a town. Around AD 150, the town appeared as Noviomagus on the world map of the Greek Ptolemaios. The same name is mentioned at the beginning of the 3rd century in the Itinerarium Antonini, a road handbook of the Roman Empire. Around the same time the name “Nemetum” appears for Speyer in inscriptions and on milestones as the major settlement of the Nemetes (Civitas Nemetum). This Germanic tribe had been allowed to settle on the left side of the Rhine in the area of Speyer under the reign of Emperor Augustus.A representative town and an administrative regional centre emerged at a central point of the Roman Rhine valley road, with a market place, wide, arcade-lined streets, public buildings, living quarters, temples and a theatre. It is practically impossible to do any digging below street level without hitting on remnants of this era. The numerous finds, for example the oldest preserved and still sealed wine bottle in Germany, can be seen in the Museum of Palatinate History(Historisches Museum der Pfalz). Roman Speyer was not spared from upheavals in the migration period. With the completion of the Limes in the 1st century AD Speyer was no longer a border town. But as of 260 the Limes could no longer contain the constant onslaught of the Germanic Alemanni and the Romans retreated back across the Rhine. The Alemanni managed to cross the Rhine repeatedly, usually in winter, and in a raid in 275 the town was all but destroyed. By the 4th century AD the settlement had recovered and a garrison was established. As a refuge for the inhabitants a stronghold was built on the cathedral hill around 370. In the beginning of the 5th century AD the whole Rhine border disintegrated under the onslaught of Germanic tribes pushing across the river. Roman culture and administration disappeared and the Romanised population took flight. Other Germanic peoples settled in the area. The population change is also reflected in the name of the town: antique Noviomagus / Nemetum becomes medieval Spira. In 346 AD Speyer was mentioned for the first time as a diocesan town, the first churches and monasteries were built in the 6th and 7th centuries, among them not only the earliest verifiable church of St. Germain, but also a bishop’s church, of which the patrons saints Maria and Stephen were named in 662/664. The economic basis for Speyer’s bishops were their possessions, substantial estates, customs and ferry levies as well as the prerogative of coinage received in the 10th century. The immunity privilege granted to church and bishops in 969 by Emperor Otto the Great and confirmed by Henry IV in 1061 placed Speyer under the protection, control and rule of the bishops. The year 1024 marked a decisive event in the history of the town. In Oppenheim near Mainz Konrad II, a Salian from the Speyer district (see Salian emperors), was elected king of Germany, drawing Speyer into the centre of imperial politics and making it the spiritual centre of the Salian kingdom. Nothing more could express this importance than the construction of the mighty cathedral. The laying of the foundation stone was the decisive impetus for the further development of the town. The cathedral was consecrated in 1061 although only completed in 1111. It was the largest church of its time and, in its monumentality and significance, symbolized Imperial power and Christianity. It became the burial place of eight German Emperors and Kings. With the Abbey of Cluny in ruins, the Speyer Cathedral remains the largest Romanesque church to this very day. A number of events, decisions and meetings in the following centuries underlined the significance of Speyer in the history of medieval Europe: Henry IV’s departure for Canossa in 1077, the preachings of Bernhard of Clairvaux and the beginning of the Second Crusade at Christmas 1141, the extradition of Richard the Lionheart to Henry VI in 1193 or Frederick II’s first journey through Germany in the year 1213. In 1294 the Emperor granted Speyer the rights of free imperial city, ending the rule of the bishops. In the shadows of these great historical events the first Jewish community emerged in Speyer at the instigation of the bishop. In 1084 Bishop Rudiger Huzmann invited Jews to move to Speyer and settled them in the former suburb of Altspeyer (the area of today's train station) which he had surrounded by a wall for their protection. Along with this invitation the bishop granted the Jews rights and privileges which went well beyond contemporary practice. They were confirmed by emperor Henry IV. in 1090 and became an example for Jew's privileges in many cities of the empire. A Jewish quarter soon also developed next to the bishops’ district near the cathedral. It's centre, the Jew’s Court (Judenhof), contained Men’s and Women’s synagogue and the Mikveh (Judenbad). The ruins of the Speyer Synagogue are the oldest visible remnants of such a building in central Europe. The Mikveh, first mentioned in 1126, has remained almost unchanged to this day and is still supplied by fresh groundwater. For two centuries the Speyer Jewish Community was among the most important of the Empire and, in spite of pogroms, persecution and expulsion, had considerable influence on Ashkenazi culture and the spiritual and cultural life of the town. Nevertheless, antisemitism and prosecution was no less virulent in Speyer than in other places and the Jewish community shared the fate of most other ones. The Yiddish surnames Spira, Shapira and Shapiro possibly derive from Shpira, the Hebrew name of Speyer. In the first half of the 16th century Speyer once again became the focus of German history. For one, this is expressed in the fact that of 30 Imperial Diets held in this century, 5 took place in Speyer. Since Luther’s posting of his 95 Theses and the Diet of Worms of 1521 creed, reformation and uprisings had become the dominating issues of domestic politics. With this background the Imperial Diet of 1526 convened for the first time in Speyer. As always for the host town of Diets, accommodation and provision for several thousand guests, the elector of Saxony alone travelling with 700 guests and 400 horses, were a challenge for the council, inhabitants and landlords. On the other hand, such events provided a town with considerable earnings. After the grand opening on June 25, 1526 with processions of princes and envoys to the cathedral and the ceremonious high mass, and after two months of much deliberation, the Diet decided upon matters which happened to be of great importance for Speyer: the Imperial Regiment and the Imperial Chamber Court (Reichskammergericht ), next to the Emperor the highest ranking representatives of state power, were both moved to Speyer the following year. Yet the pressing questions of religion remained unsolved. The ambiguous resolution of the Diet that each estate should behave as it saw fit before God and the Emperor, favoured the expansion of Luther’s doctrines. In March 1529 the Imperial Diet again met in Speyer (see Second Diet of Speyer). The argument about religion, conscience and obedience divided the Imperial estates. On April 19 a majority decided to rescind the Imperial resolution of the last Diet in 1526 and to reconfirm the Edict of Worms, passed by the Diet of Worms in 1521, imposing the Imperial ban on Luther and his followers. This resolution outraged the participating evangelical princes and Imperial towns. On April 20, they drew up a letter of protest which was rejected by the Diet but then delivered to Emperor Charles V. This Protestation at Speyer sealed the schism of the Christian church and is considered the birth of Protestantism. From this time on the adherents of the reformation movement were called Protestants. 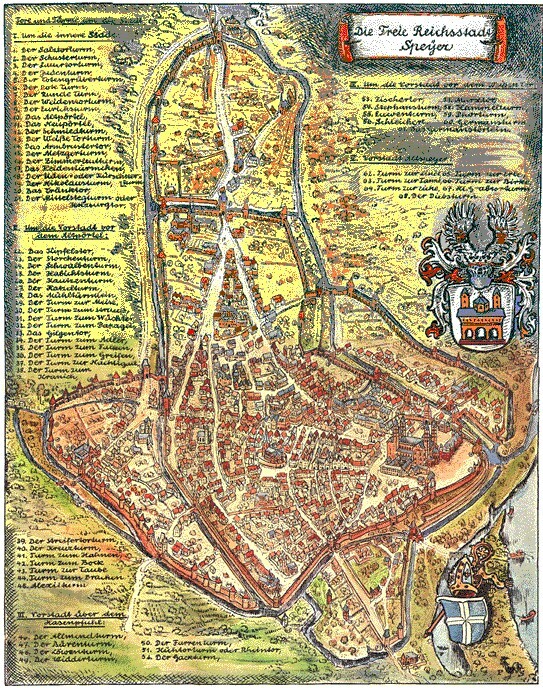 The Imperial town of Speyer chose to side with the Protestants and the 17th century was distinguished by its alliance with the Protestant Union and by the influence of the Catholic League personified by the Bishop of Speyer.In the turmoil of the Thirty Years’ War Speyer, walled but hardly able to defend itself, found itself in the range of the often embattled fortresses of Frankenthal , Friedrichsburg, Philippsburg and Landau . Thus the town took on the roles of refuge, military hospital, supply post and troop camp. In addition, it was occupied by Spanish, Swedish, French and Imperial troops in quick succession and it was only in 1650 that the last armies left the town, leaving behind debts, hunger and disease. Again in 1688 troops stood at the gates of Speyer, this time from France. In the “War of the Palatine Succession” (1688–1697) — also called the “War of the Grand Alliance”, the “Nine Years’ War” or occasionally, the “War of the League of Augsburg” the town experienced the greatest and most far-reaching destruction in its history: the expulsion of its inhabitants and the whole town put to the torch, including cathedral, churches, monasteries, and guild halls. Over 700 houses were destroyed and many towers and gates of the town fortifications were blown up. The Baroque buildings of Trinity Church, the town hall and the town store (Old Mint) were erected in the decades of reconstruction which started in 1698. After the town had been occupied by Austrian troops it was taken by French revolutionary forces in 1792 and remained under French suzerainty as a district capital in the department of Mont Tonnèrre (Donnersberg). With the Napoleonic occupation of large parts of Germany the achievements of the French Revolution were also granted to the citizens of Speyer. As well, in 1804 the Napoleonic code (Code Civil) was introduced in all German areas to the left of the Rhine annexed by France. Even after the fall of Napoleon and the return of the Palatinate to Germany the code stayed in place until the introduction of the unified German Civil Code (BGB) in 1900. The Wars of Liberation against Napoleon and the restructuring of the European states at the Vienna Congress in 1815 again changed the structures of power in the Palatinate and Speyer. Once again it stood in the limelight of “big politics” when Tsar Alexander I of Russia, Emperor Francis I of Austria, and King Frederick William III of Prussia met in Speyer at the allied headquarters on 27 June 1815. In 1816 Speyer became capital of the district of the Palatinate. The area had been given to the Kingdom of Bavaria after the Congress of Vienna as compensation for Salzburg, which had been ceded to Austria. It was only on 1 January 1838 that the name “Pfalz” (Palatinate) was officially introduced for the area. This growth in administrative importance brought numerous authorities and thus people into the plagued town which had suffered from depopulation during the occupations. In the first half of the 19th century the population doubled. A number of construction projects brought business and prosperity and the first residential quarters appeared outside the ancient city walls. The Rhine harbour was extended by 1837 and by 1847 Speyer had been linked to the railway network. There are social and charitable institutions such as work and educational institutions for girls, a charity club for the Jewish community and a hospital). Regarding education, the town has numerous educational institutions making it the best-structured school system in the Palatinate. Apart from the modern legal system introduced by the French, the Palatinate population had become accustomed to more liberal attitudes than their German compatriots to the east of the Rhine. This continuously lead to tensions with the Bavarian king and government. The initially liberal minded king failed in reinstating press censorship, which he himself had abolished just shortly before. Thus, the liberal and democratic trends of the ‘Vormärz’ (March, 1848) turned Speyer into a regional centre for newspapers and the press with such renowned publications as the “Speyerer Anzeigeblatt” and the “Neue Speyerer Zeitung”. Renowned sons of the town at this time included the artist Anselm Feuerbach (*1829), the poet Martin Greif (*1839) and the artist Hans Purrmann (*1880). After the Revolution of 1848 had been crushed many of its proponents fled the country and many others preferred to emigrate. With the administration dependent on Bavaria the Restoration and petty bourgeois mentality had quite a level playing field in Speyer. The liberal Speyer papers soon perished. In Munich, the Palatinate was considered to be defiant and the reins were held very tightly, to be somewhat loosened only towards the end of the century. The Wilhelmian era provided Speyer with numerous stately new buildings: In commemoration of the Protestation of 1529 the neogothic Memorial Church (height: 105 m), begun in 1890, was consecrated in 1904, with financial support from Emperor William II and from Protestants all around the world. The event gave cause for considerable criticism in a town characterized by a Catholic cathedral and bishop. In reaction, only a few metres away, the Catholics built the twin-tower Saint-Joseph’s Church (height 92,5m). Together with the 4 towers of the cathedral and the Altpörtel these two churches dominate the skyline of Speyer. Between 1906 and 1910 the Historical Museum of the Palatinate was erected. With the neighbouring building of the district archives, the Protestant Consistory, the Humanistic Grammar School and the Bishop’s seat built around the same time, the cathedral square received a character which it has kept to this very day. Another building worth mentioning of the Wilhelmian period is the train station.With the end of World War I and the occupation of the west bank of the Rhine in 1918, French troops once again occupied the town. As early as the end of 1918 the French occupational forces under General Gérard supported a movement under the leadership of Ludwig Haass, which called itself “Free Palatinate”. This was one of several separatist movements in the French occupation zone on the left bank of the Rhine. In early summer of 1919 the Free Palatinate attempted a putsch in Speyer for an autonomous Palatinate. This attempt failed miserably, especially because of the resistance of the deputy chief administrator, Friedrich von Chlingensperg (1860–1944), who could count on the support of the majority of the Palatinate parties. After a few hours the poorly planned coup was aborted. However the call for a free Palatinate was not yet dead and Speyer was to remain the focus of such endeavours. Only a few years later voices again were raised to separate the Palatinate from Bavaria. Among these was former prime minister Johannes Hoffman, who unsuccessfully tried to separate the Palatinate from Bavaria and form an independent state within the Empire on 24 October 1923, while Munich was being rocked by civil-war-like conditions. At the same time more radical separatist groups were forming with the goodwill of the French who still kept the left bank of the Rhine occupied. In a coup in Aachen on 21 October 1923 under Hans Adam Dorten the “Rhenisch Republic” was proclaimed in the north of the occupation zone. Starting in November 1923 separatists occupied several towns in the Palatinate and also raised the green, white and red flag. On 10 November the rebels stormed the government building in Speyer. The leader of the separatists was Franz Josef Heinz (1884 – 1924) from Orbis near Kirchheimbolanden, member of the district council for the Deutsche Volkspartei (DVP). He proclaimed the “Autonomous Republic of the Palatinate”. While the new government was getting itself established, resistance was already being organised on the opposite side of the Rhine. On the evening of 9 January 1924, 20 men who had crossed over the frozen Rhine stormed the “Wittelsbach Court”, a hotel-restaurant in Speyer, where Heinz was dining and shot him, an aide and an uninvolved third person. A monument still exists in the Speyer cemetery to two of the paid murderers who died in a shoot-out after the assassination.In 1929 and still under French occupation the town celebrated the 400th anniversary of the Protestation. The following year Speyer celebrated the 900th anniversary of the founding of the cathedral under Bavarian suzerainty. The seizure of power and the "Gleichschaltung" (forcing into line) by the Nazis in 1933 also took place in Speyer. The Speyer Synagogue was burnt down 9 November 1938 and totally removed soon after. With the beginning of the “Thousand Year Reich”, once again the Jewish population was expelled from Speyer and most of them were killed. Speyer escaped the great bombing raids of World War II; one of the few bombs falling on the town destroyed the train station. Speyer was taken by the American army, but not before the bridge over the Rhine was blown up by the retreating German army. Until the founding of the Federal Republic of Germany in 1949, Speyer was in the French occupation zone and once again became a garrison town of the French. General Charles de Gaulle took a military parade in front of the cathedral. With its establishment on 30 August 1946, Speyer became part of the new federal state of Rhineland-Palatinate (Rheinland-Pfalz). In the economic upswing of the 1950s and 1960s Speyer expanded considerably: new residential and commercial areas were developed, schools, administrative buildings and hospitals were built. After much debate, the main street (Maximilianstrasse) along with some smaller side streets was turned into a pedestrian zone. For the 2000-year celebration in 1990 the main street, the cathedral district and some parts of the medieval town were elaborately renovated with a new design and Speyer has developed into one of Germany’s important tourist centres. In 346 a bishop for the town is mentioned for the first time. In 1030, emperor Conrad II starts the construction of Speyer Cathedral , today one of the UNESCO World Heritage Sites. In 1076, emperor Henry IV embarks from Speyer, his favourite town, for Canossa . In 1096, during the First Crusade, the Jewish community of Speyer was massacred. In 1294 the bishop lost most of his previous rights, and from now on Speyer is a Free Imperial City of the Holy Roman Empire. Between 1527 and 1689 Speyer is the seat of the Imperial Chamber Court . In 1526 at the First Diet of Speyer, interim toleration of Lutheran teaching and worship is decreed. In 1689, the city was heavily damaged by French troops. Between 1792 and 1814 Speyer was under French jurisdiction. In 1816 Speyer became the seat of administration of the Palatinate and of the government of the Rhine District of Bavaria (later called the Bavarian Palatinate), and remained so until the end of World War II. Between 1883 and 1904 the Memorial Church is built in remembrance of the Protestation of 1529. In 1947 the State Academy of Administrative Science was founded (later renamed German University of Administrative Sciences Speyer). 1990 2000th anniversary of Speyer.